WheelTurnerHawaii.com: WheelBaseMag - Hawaii Is Mo Bettah! Check out this EPIK write up Amanda Powell wrote about here Hawaii trip. 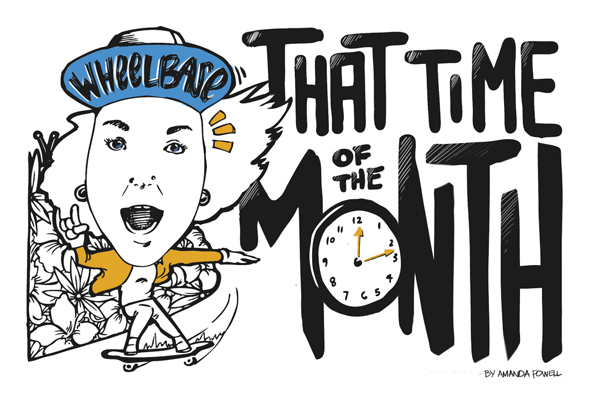 Check out this rad story and more over at www.wheelbasemag.com. "The Wheel Turner Hawaii crew hosted an outlaw race on Maui that was without a doubt the most fun I have ever had racing, ever." Im STOKED that they were Stoked! Hope to see the crew on the islands again in the future! My good pal and fellow Paris Truck Co rider, Matt K, asked me a couple of months ago if I wanted to join him on his eighth or tenth skate mission to Hawaii—I guess he lost count at some point? As you can imagine I agreed to tag along without hesitation, wondering what it was about the islands that kept him and so many others coming back for more. Once there, it didn’t take long to understand what draws people to the Aloha State. Ethan shows Amanda some winding Hawaiian goodness. Photo: OSL. Hawaii is magical. I split two weeks between Oahu and Maui and now I’m looking for any excuse to get back there. As I’ve mentioned before, it’s important to link up with locals and trust the advice they give while you’re on their turf. 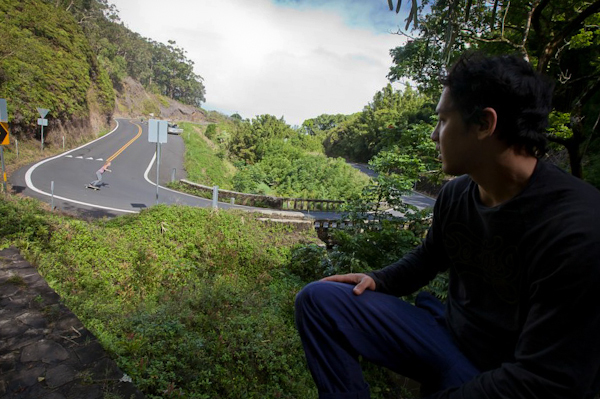 Ethan Lau, an Oahu native, graciously showed us the hidden treasures of his island. Our crew rolled around Oahu in the back of his pick up truck with our skateboards and a machete—ready for every adventure. Ethan has an eagle-eye for ripe plants, and we harvested all that we could. Coconuts, jackfruit, lillikoi, avocados, macadamia nuts, bananas, and mangos—we filled our bellies with free organic goodness everyday and our bodies were thankful. If we couldn’t find something growing, we found it fresh at the unattended fruit stands. These fruit stands are scattered amongst the islands and run on the honor system, which restored some of my faith in humanity. 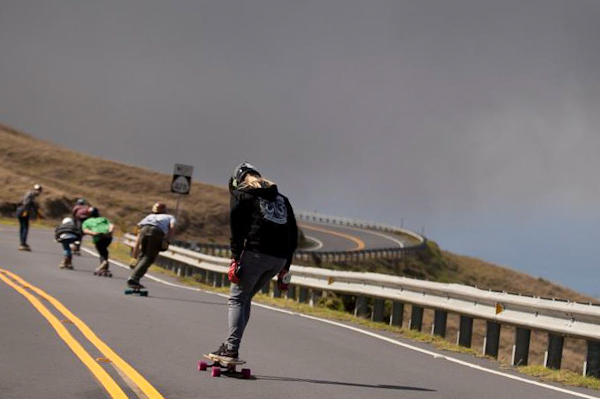 Fueled by the produce we sampled, we skated neighborhood hills, ditches, jungle runs, volcano crater roads, and skateparks all over Oahu. Skate sessions were the only time some of us put our shoes on. (Ethan and Matt K kept it pure island-barefoot-style.) After skating, we made a habit of cooling off under waterfalls or hopping in the ocean. Hawaii embraces the way I love to live: fully grounded, mud on feet, and salty hair. A view from the road above. Dudes be getting pitted down there, brah! Photo: OSL. Amanda and the boys headed from mountain to sea. Photo: OSL. The skateboarding on the islands was surely top-notch, but what I loved most about Hawaii is the incredibly evident Aloha Spirit. Respect is huge and extremely important here—everyone is family. I met aunties and uncles who were far from my parent’s siblings but the endearing nicknames made complete sense when I was on the islands. The strong sense of family extends far beyond traditional bloodlines, and it creates a really beautiful vibe with all your aunties, uncles, sistahs, and brahs. I felt as though I could literally walk up to anyone on the islands and have an honest conversation with them, which is something I have been missing in Los Angeles where the public seem to be glued to their iPhones, avoiding interaction with strangers at all costs. Even the language in Hawaii is delightful. Locals speak Pidgin, which is a language influenced by English, Hawaiian, Portuguese, and Cantonese. I can understand some of it, depending on how heavy they speak it. I think they took it easy on us haoles (white people) while we were there. Ha ha! In Hawaii I found all the good things that I didn’t even realize I had been missing: genuine human kindness, lush greenery, the smell of the earth, silence, being barefoot, no-stress skateboard racing, amongst other things. Luckily I live only a five-hour flight from this paradise; I will certainly be going back for more. Following suit with Matt K, I simply cannot get enough of Hawaii. Mahalo to all the locals for hosting us, I’ll be seeing you soon. Shoots!